Federal Tire has triumphed again in the Red Dot Award 2018. 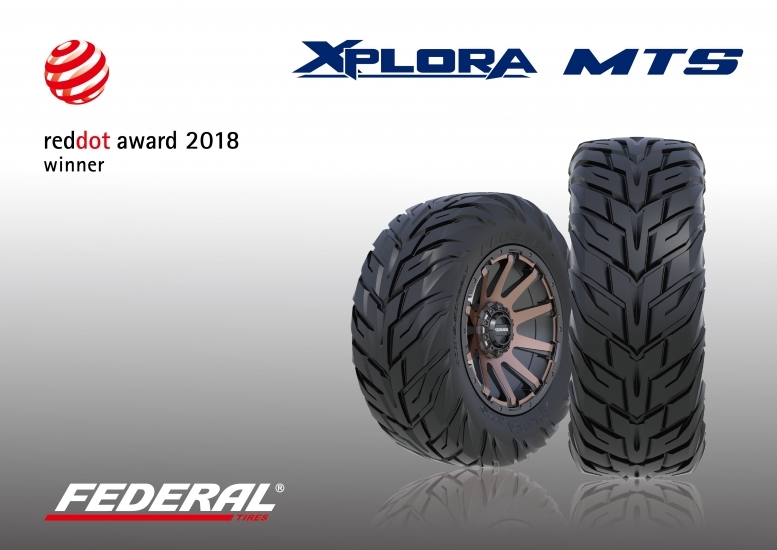 Continuing its success of 595 RS-RR in the 2017 Red Dot Award, Federal’s all-new Xplora MTS 4x4 tire, has received industry recognition for its impressive outlook, exceptional driving experience, and prolonged endurance. The radical tread patterns of Xplora MTS 4x4 tire are inspired by Spartans and their armor, which are not only renowned for their fierce and mighty, but also symbolizing Federal’s relentless pursuit for tire quality to ensure uncompromising driving excitement, reliability and performance. In addition to its burly beauty and brawn, the Xplora MTS’ linear tread design contributes to reduced aquaplaning and noise. Big V-shaped grooves reinforce structural rigidity while massive and resilient tire blocks grant elite steering and control. "Winning Red Dot Award consecutively is truly monumental to our tire performance and quality. We are very proud that our Xplora MTS has received such global recognition from the Red Dot Award again and we will continue to enhance our product competitiveness through continuous R&D concentration," said Da-Wu Chen, Global Sales and Marketing Director of Federal Tires. The Red Dot Design Award is considered one of the world’s biggest design awards. Evaluations are made based on innovation, aesthetic characteristics, applicability, functionality, and efficiency. This year’s Red Dot Design Award included applicants from over 59 countries and 6,300 products.